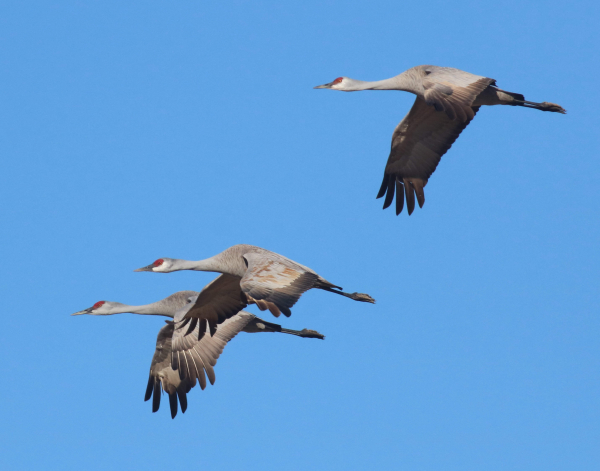 Sandhill Cranes offer great springtime memories, and you can help collect information about Sandhills during the Midwest Crane Count on Saturday, April 13. Plan to participate in the 44th Midwest Crane Count on Saturday, April 13th as Sandhill Cranes migrate back to the Midwest from their wintering range in southeast states, and you may even get to see rare Whooping Cranes. More than 1,000 volunteers participate in the annual spring crane survey that gathers information on the abundance and distribution of cranes in the upper Midwest. Volunteers collect data in more than 90 counties in Wisconsin and portions of Minnesota, Iowa, Illinois, Indiana, and Michigan. The International Crane Foundation sponsors the Crane Count as a part of its mission to conserve the world’s 15 species of cranes and the natural communities on which they depend. Observations of Sandhill Cranes can lend insights into the threatened crane species of the world, including the endangered Whooping Crane. There are now 100 Whooping Cranes in the reintroduced population that nests in Wisconsin, and some crane counters may have a chance of sighting a Whooping Crane during the survey. New volunteers interested in taking part in the survey should first contact their local County Coordinator for instructions. Visit www.cranecount.org for the list of 2019 County Coordinators. Try it, you will enjoy the experience!